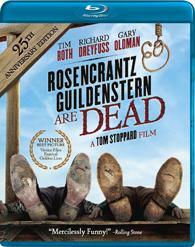 Winner of the prestigious Venice Film Festival's Golden Lion (Best Picture), Rosencrantz & Guildenstern Are Dead is based on Tom Stoppard's award-winning play. It's the inventive tale of Hamlet as told from the viewpoint of two of the work's supporting, but certainly more outrageous characters. In this cleverly inspired version, however, the Shakespearean equivalents of Laurel and Hardy get a chance to take the lead roles in a dazzling setting where illusion and reality overlap. Is free will merely an illusion? Is choice just a comforting lie we tell ourselves to hide the strings that truly manipulate our lives? Are the winds of fate forever doomed to blow in one direction? Well, if you're a character in a film with all your lines and actions already written down for you… then yes. Yes they are. And such is the case for poor Rosencrantz and Guildenstern, a pair of hapless pawns who never quite seem to be in control. An existentialist re-telling of a Shakespeare classic tinged with a hint of absurdism and a splash of metafictional contemplation, Tom Stoppard's 'Rosencrantz & Guildenstern Are Dead' offers a decidedly different take on 'Hamlet' -- one seen from the eyes of two very minor and ultimately very dead characters. 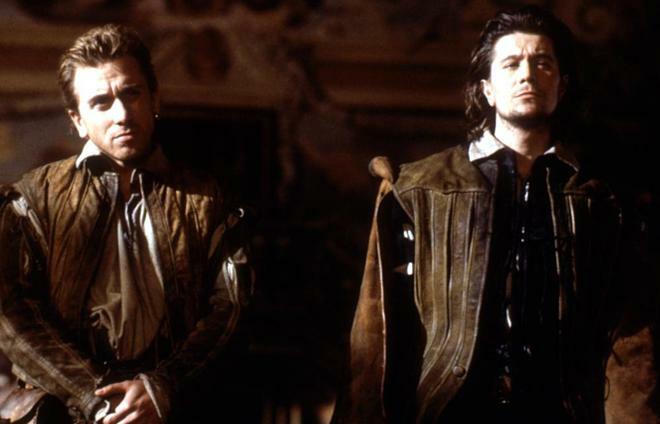 Based on Stoppard's original stage play, which itself is partly based on William Shakespeare's 'Hamlet,' the story shifts its focus from that famous brooding Prince toward two tertiary characters -- Rosencrantz (Gary Oldman) and Guildenstern (Tim Roth). Childhood friends of Hamlet, the inseparable duo are charged by the King to find out what is suddenly making the Prince act like a madman. As the major plot points from the original text play out in the film's periphery, we follow the narrative from Rosencrantz and Guildenstern's perspective, leading to an entirely different point of view that oscillates between amusingly absurd and mournfully lucid. In one of the film's first scenes, a befuddled Rosencrantz flips a coin over and over again. Though the odds of the coin landing on heads or tails are roughly 50/50, the coin lands on heads ninety-two times in a row -- an ostensibly random act that now seems pre-determined. From the get-go, we are introduced to a universe where these characters are relegated to a single outcome -- all other options apparently off the table. Their fate on the gallows from Shakespeare's original play is already set in action, waiting for them. The coin will always land on heads. We merely have to go through the motions. This pervading theme of fate versus freewill, and predestination versus randomness continues throughout the runtime, often blurring the line between each dueling side as the characters embark on their tragicomical misadventure through the Bard's classic tale. 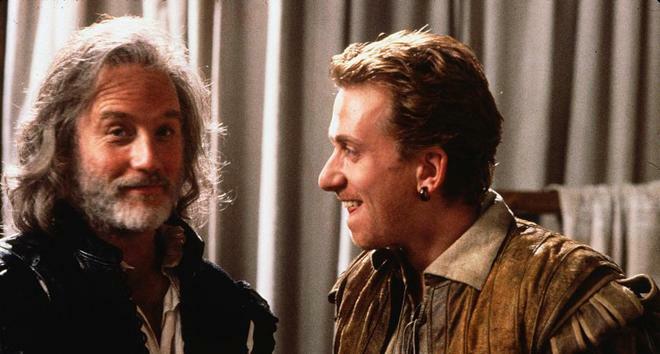 Throughout their frequent verbal spars, Oldman's Rosencrantz mostly fills in the role of an innocent fool while Roth's Guildenstern seems more focused and discerning. With that said, neither of the pair can seem to keep straight which one of the two they actually are. As the characters around them mix up their names, so too do they; even their identities seem to be slipping out of their control. Musings on art versus reality and the meaning (or meaninglessness) of death are also thrown in for good measure, including a poignant monologue from Rosencrantz and repeated visitations from an acting troupe led by a mysterious Player (Richard Dreyfuss). These latter sequences feature some metafictional flourishes that see the actors playing out the major beats from Hamlet. These more contemplative beats offer a fitting contrast to Stoppard's otherwise light and humorous wordplay -- including a brilliant sequence that sees the title duo volley their words in a game of questions set up like an oral tennis match. The witty dialogue is also complemented by some fun silent film influenced anachronistic sight gags (Rosencrantz makes an airplane) and physical bits (he also tends to fall down). A repeated motif that sees the man inadvertently stumble upon and inevitably screw up demonstrations of basic scientific laws also leads to some healthy laughs. Likewise, Stoppard has some fun with how he chooses to integrate portions of the original 'Hamlet' play with his own creation, weaving Rosencrantz and Guildenstern into the background as hapless observers that deflate the drama of several major scenes with their own silly shenanigans. And though the switch between true Shakespearian dialogue and Stoppard's own can sometimes be jarring, this contrast is actually used to deliberate comedic effect as well. Whether the characters' lives, deaths, and actions end up the result of choice or fate, or whether they end up holding any meaning is ultimately left up to the viewer to decide, but as Stoppard hints at the duo's cyclical fate, it seems as if the director is implying a certain sense of futility -- at least where fictional protagonists are concerned. But even beyond these more existential and metafictional ruminations, the film works as a wonderfully entertaining bit of slapstick comedy and clever wordplay, successfully stealing the spotlight from that whiny Danish Prince. Image Entertainment brings 'Rosencrantz & Guildenstern Are Dead' to Blu-ray on a single BD-25 disc that comes housed inside a standard keepcase. After some logos and warnings, the disc transitions to a traditional menu screen. The packaging indicates that the release is region A coded. The movie is provided with a 1080p/AVC MPEG-4 transfer in the 1.85:1 aspect ratio. Though noticeably inconsistent, the modest image gets the job done just fine. The source is in good shape, but there are some signs of minor age and damage, including faint scratches, lines, and dirt. Unfortunately, overall clarity and grain do tend to waver (sometimes dramatically) from scene to scene. Early scenes set outdoors and at night are the most uneven, with some shots offering a rougher grain structure than others, and there appears to be some minor haloing around characters in the opening sequence. Likewise, dark shots also tend to crush a bit and blacks veer toward a noisy blue at the edges of the frame. Thankfully, these inconsistencies mostly clear up in the castle scenes, but detail remains fairly soft throughout. Colors adhere to a relatively drab and faded palette with an emphasis on grays, browns, and greens but this style is seemingly intentional and suits the period piece content. Thankfully, contrast is balanced well without blooming. It's hard to say whether the inconsistencies present here are a result of a subpar master or merely inherent to the original low budget production, but the end results are rather uneven. The film is presented with an English DTS-HD MA 2.0 Surround track along with English SDH, and English subtitles. Livelier than expect, the mix does a solid job of subtly enhancing the atmosphere while placing proper emphasis on dialogue. Speech is clean and well prioritized throughout, allowing all of Tom Stoppard's witty and insightful lines to come through clearly. Nature ambiance is spread appropriately and even hits the surrounds with solid engagement. Likewise, once we move to the castle, background noises like crackling fire chime in. Voices and effects like galloping horses are spread directionally when called for as well, panning between the speakers with natural imaging. The film's climax even kicks things up a bit with some canon fire, but LFE activity is pretty lacking compared to a full surround sound action mix. 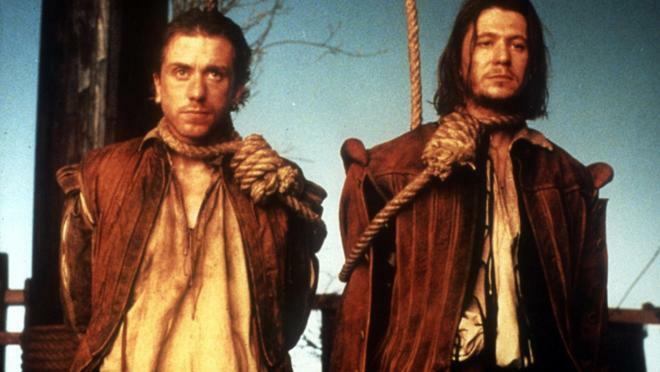 Given the modest material, 'Rosencrantz & Guildenstern Are Dead' sounds pretty good on Blu-ray, with a subtle but effective 2.0 surround mix. 25th Anniversary Interview with Tom Stoppard (HD, 56 min) – Presented in 1080p, this recent retrospective interview with director Tom Stoppard that traces the play's origins and its path toward becoming a movie. Likewise, Stoppard also discusses his overall experiences writing for film and the theater. Tom Stoppard (SD, 59 min) – Causing a rather perplexing case of déjà vu, this is an earlier archive interview with the writer/director that features very similar questions and answers to the above interview. In fact, though years separate them, some of the material is essentially identical. Thankfully, there are few unique tidbits, including more details on casting and Stoppard's overall interpretation of the story. Gary Oldman (SD, 58 min) – Here we get an archive interview with the actor. Oldman shares his thoughts on the story, themes, and character while elaborating on his overall career and what it was like working with Stoppard. Tim Roth (SD, 33 min) – Another archive interview is included, this time with actor Tim Roth. The film's co-star discusses how he got involved with the film, and also shares his thoughts on the characters and what it was like to work with the director. Richard Dreyfuss (SD, 46 min) – The final archive interview is with Richard Dreyfuss. Once again, the actor is asked about his thoughts on the play's meaning and talks about his character, working with Stoppard and his overall career. Tom Stoppard's 'Rosencrantz & Guildenstern Are Dead' offers a clever tragicomic spin on Shakespeare's 'Hamlet.' Through clever wordplay and existential observations, the writer/director examines concepts of freewill, the relationship between art and reality, and the very nature of life and death. On the technical front, the video transfer is a bit uneven but gets the job done and the audio mix is solid. Supplements include some worthwhile interviews, rounding out a nice 25th Anniversary release. Recommended.